Television matures as the country is thrust into political conflict. 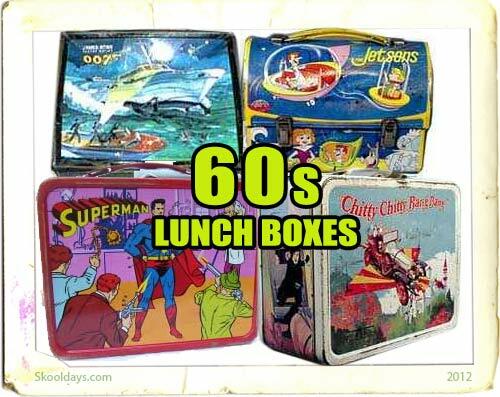 Lunchboxes keep pace, reflecting the rise of Saturday morning TV and contemporary social values. The Westerns die out, making room for high-tech spy shows and science-fiction series in prime time. The Space Age makes the universe more tangible and by the end of the decade a man walks on the moon. Aladdin, King Seeley and Ohio Art help the nation’s children safely carry lunch to school, with Aladdin and Seeley splitting most of the licensed product character boxes between them. From The Jestsons to Star Trek to The Man From U.N.C.L.E. to astronauts and campus queens, lunchboxes increase in popularity and sophistication of design. This entry was posted in LunchBox and tagged 1960 by Skooldays. Bookmark the permalink. Does anyone remember the lolly called Blackcurrant Rhyme not sure who made it I think probably lyons maid ? While I don’t remember these (and I didn’t grow up in Britain) I did just spot a fantastic ad for Blackcurrant Rhyme right next to one for another lolly called Cider Gold in an episode of the old series Thriller “File it Under Fear” from 1973, about 4 minutes in. The ad was so distinctive I googled it and found your question!